Stony Brook University and Hauppauge-based Island Federal Credit Union (“Island”) today announced a 10-year, $7 million corporate advertising sponsorship agreement that reaches across multiple areas of the University community including athletics, arts, academics, medicine, the Veteran’s Home and alumni relations. 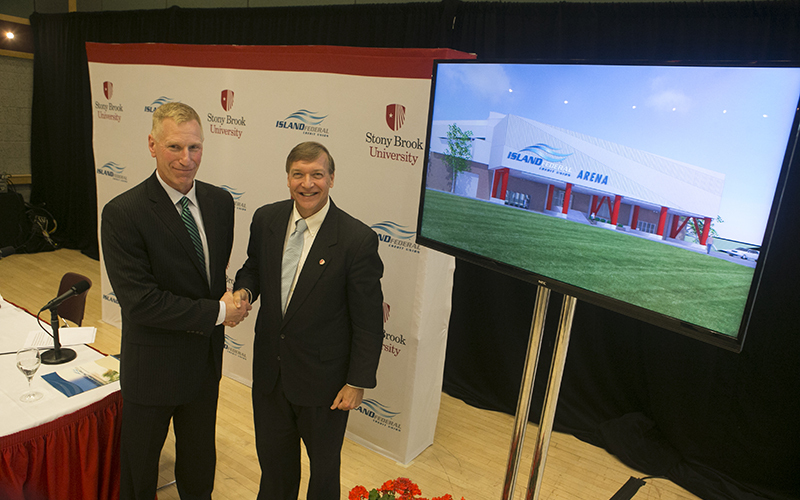 The agreement, facilitated under the auspices of the Faculty Student Association (FSA), a 501(c)(3) organization, consists of a long-term arrangement that includes two retail banking branch sites and ATMs at various locations on campus; title sponsorship for the newly renovated 4,000-seat Stony Brook Arena; title sponsorship for the 20-year old Stony Brook Film Festival; partnership in banking education through the Stony Brook University College of Business; support for Stony Brook Medicine programs including the new Stony Brook Children’s Hospital and the Long Island State Veterans Home; and, a commitment to support and provide benefits to Stony Brook University alumni. New and exciting academic partnerships that can strengthen the Long Island banking sector through education and research.